If you have ever gone hunting for a job, then you may be familiar with a job refusal letter. Not everyone necessarily gets the job they want, which is what this kind of letter is for. These letters can help you understand how and why you may not be suited for a particular job. Of course, it would pay to use a polite rejection letter, to help let you down gently. Such letters would have to possess certain elements, such as a polite and professional tone, a list of reasons why an applicant is unsuitable, and a list of how to improve themselves next time. You should first thank the applicant for their interest in the position. Also be clear about whatever reasons you had for rejecting them. Be sure to list positives the applicant had, so as to point out what they did right. Also offer tips for the applicant so that he can improve his approach on his next applications. Help them improve, as these reasons can be good points for helping them understand what they need to do differently. Inform them if they lacked some kind of qualification for the position, such as documents, so they know to take steps to do better. Also to tell if they were unsuitable for the position due to a lack of experience or the requisite academic background. If yours is a clearly meant as a rejection letter, then the rejection should be clear and unambiguous. This way, you leave no question about the applicant having been rejected. It is also important not to be too blunt. While you are rejecting applicants, you are not expected to be tactless. A level of professionalism is required, and you should be able to write a rejection letter without it sounding like a put-down. 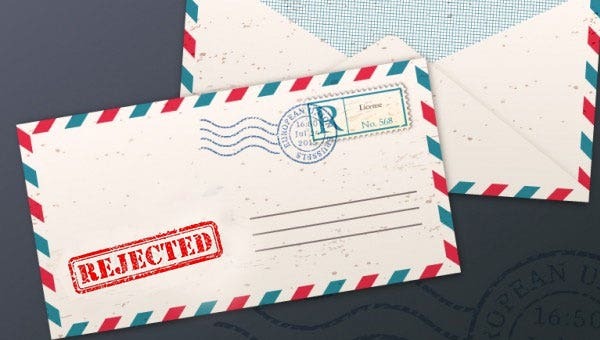 Remember to be positive in your rejection letters, as no applicant can be completely without merit. If you are going to be supportive, be sure to mention the applicant’s strengths so that they can remember to play to those when applying in the future. It may interest you to know that there are other kinds of letter templates available on this site. This can be a source of benefit to you, if you have a need for templates to help you write any letters you need to. 104+ Letter of Intent Templates – Free Sample, Example Format Download!